Here are various web sites which provide other information about Randolph Caldecott. We aren't responsible for their contents! For more information on the items below, click to expand the list. Click on underlined names to go to their website; your browser should open a new window for this. To bring together those people who are dedicated to the remembrance, appreciation and promotion of English Illustrator Randolph Caldecott (1846-1886) and his art. To serve as a lay caretaker of Caldecott's grave in Evergreen Cemetery, St. Augustine, Florida. To maintain a floral tribute on the grave. To donate the annual Caldecott Medal-winning book, along with the winning Honor book(s), to the local Public Library's "Randolph Caldecott Children's Room". To produce and distribute a brochure, and establish and maintain a website, about Caldecott. To award an Honorary Membership to a person who has exhibited support of the society and who promotes and collects the works of Caldecott. To give presentations on the life and art of Caldecott upon request. This medal is awarded annually by the Association for Library Service to Children, a division of the American Library Association, "to the artist of the most distinguished American picture book for children" produced in that year. It was established in 1938 by Frederic G. Melcher, chairman of the board of the R. R. Bowker Publishing Company and Editor of Publishers Weekly. The front of the medal is of John Gilpin, and the back is of the man carrying the pie baked with the blackbirds from "Sing a Song for Sixpence". Records of Births, Marriages and Deaths, and Wills. These are all informative - Wills in particular are useful because close relatives are often named as beneficiaries. Census records. These also provide useful snapshots, at 10-yearly intervals, of who is living where, and who else is with them: family members and (in Victorian days) any household staff too. "The World we have Lost" by Peter Laslett (paperback, 376 pp, publ by Routledge, Dec 1983, ISBN 0415029759; or hardcover, 400pp, publ by Methuen, Dec 1983, ISBN 0416353401): most interesting and informative. Huge and well-indexed database of over 130,000 links to genealogical and family history websites worldwide. Includes useful info for beginners. Provides info about genealogical data sources for the UK and Ireland, but is primarily geographically-based. For our Caldecott family, look up "Cheshire" and then search the index by name. This site, a derivative of the popular "Friends Reunited", has rapidly become a valuable site for family history researchers. It can be searched for free, but if you want to post a query or send a reply to an existing query, you need to become a member. Membership costs GB£9.50 per year. New in 2002, this site is "for anybody researching UK genealogy, family or local history. 50,000 counties, towns, villages and hamlets with contact boards, surname lists and links to the exact location on old maps and modern maps." Anybody offering help or with just a passing interest does not need to pay a penny but anybody who wants help or is an enthusiast can join to get "green" mailboxes. Full membership costs GB£5 or US$8 per year but free users are welcome. Offers "Legacy" software, a basic version free or a Deluxe edition (US$19.95 at 4/2004) which provides a way of storing genealogical data in a standard (.GED) format, and displaying it in various ways. Claims to provide more features than PAF (see next paragraph). This site is run by the Latter Day Saints (Mormon) church, but includes numerous genealogical records for people who had no connection with Mormonism. It also offers free software, including "Personal Ancestral File" (PAF). Their "International Genealogical Index" holds records of over 200 million names. Another Mormon facility, but useful. Randolph Caldecott's grave is listed, thanks to the R C Soc of USA. For a newsgroup specifically on Caldecott Family Genealogy, see higher on this page: click here. "A history of the Toy Book : the aesthetic, creative and technological aspects". PhD Thesis by Tomoko Masaki at the University of Surrey, Roehampton, UK, 2000 (3 volumes). These Libraries' Websites mention one or more works by Randolph Caldecott which they hold. But before attempting to visit in person, check with them what permission or advance notice is needed and what evidence of identity you will have to produce. Search for "Caldecott" and there are over 130 records for Randolph (and some for at least 3 other Caldecotts). But, as far as we can see, these records do not include the items in the V&A's Print Room. Go to this site, click the square marked "Search"; in the "Author" box enter "Caldecott Randolph" (surname must be first); click the button marked "All material" then click "Submit Search" which should show 69 items. Note: although the British Library has exhibitions and permanent galleries open to the public, special permission has to be obtained for access to their huge collection of books, many of which are not held at the London site. Permission is usually only granted to researchers who can show that the item they wish to see is not available elsewhere. All the books are included in the Library's Online Catalogue. A link to it is on the page whose URL is given above. Holds a copy of "The hey diddle diddle picture book, 1883". Holds a copy of "R. Caldecott's Picture Book No. 2". We could only find 35 records of Randolph Caldecott's books in their database, and could not find some known American editions. We found the best of their Search categories was "Author/Creator Sorted by Title" with the search item entered as "caldecott, randolph, 1846-1886". See also information on our "Where" page about the British Museum and Victoria & Albert Museum Collections, London, UK, neither of which yet have all their Caldecott items on lists accessible via the Internet. 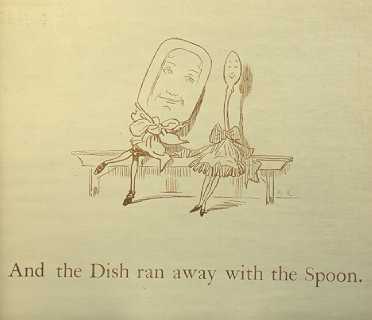 This site even plays the tune as you read the nursery rhyme and view Randolph's illustrations! The Randolph Caldecott Society UK is a member organisation of this. For books about Randolph Caldecott, see our "Find out more" page. Asbjorn Lonvig. Modern Danish artist & children's illustrator. His website (in up to 8 languages) includes a Links page with lots of links to other sites about art and artists. More links will be added. Bookmark this page to check it for additions. If you know of other sites with useful relevant info, please contact us.